42-18-29. Any guesses as to what these numbers represent? Nope, they're not my measurements (which are not something I'll ever be sharing here by the way). I'd be rather top heavy if they were. Funny enough, these numbers do actually show that I am 'top' heavy in a manner of speaking. 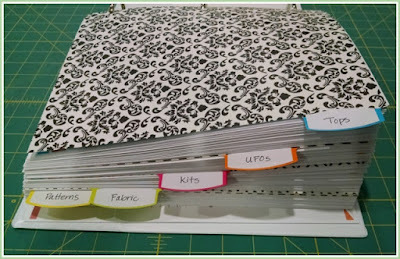 I recently went back through my binder, trying to think about what my quilty goals are this year. During Christmas I saw a lot of people decorating with their Christmas quilts and I realized how few of them I have. I'd really like to have more to display next Christmas. 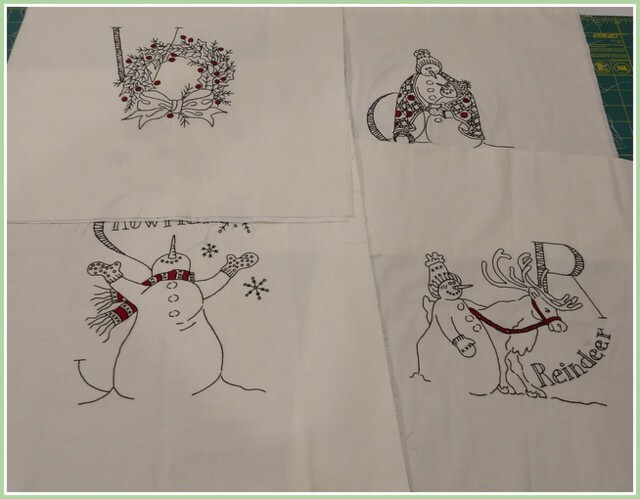 I have 3 Christmas tops that still need to be quilted. This first one is almost 10 years old and is a Shadow Applique quilt. It will actually be a gift, but I still want to get it finished this year. 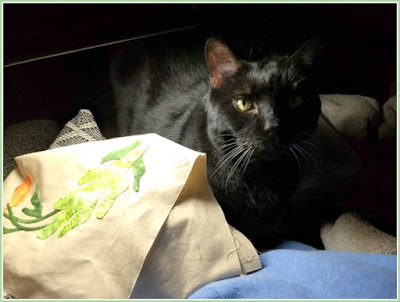 All the applique is covered in silk chiffon and with 3 kitties, I don't see it surviving long in my house, but I have a kittyless friend who would love it! I finally made Starry Eyed last year. This was a very popular Moda Bakeshop pattern from 2011 using the Countdown to Christmas fabrics from Sweetwater. I loved the quilt so much, I bought the fabric way back then but only just got around to making it. I believe they're coming out with a follow up fabric line to this called Overnight Delivery this year. 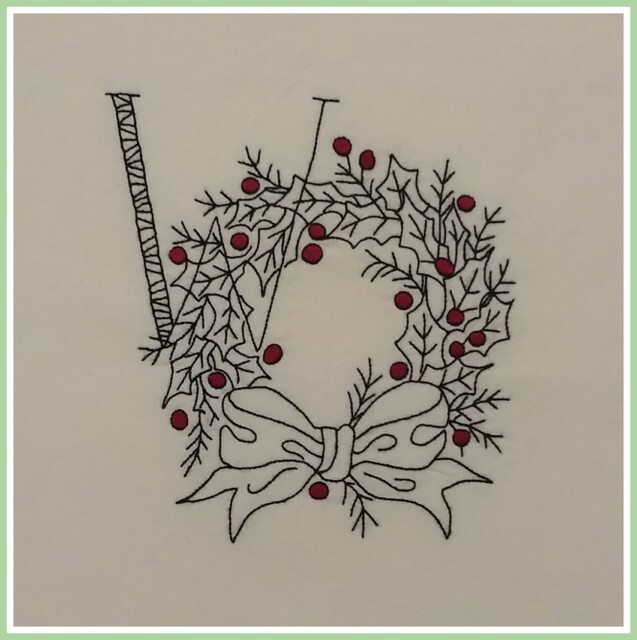 And the last Christmas top I have is Winter Wonderland by Crabapple Hill Studios. I already quilted a blue version of this for my mom several years ago, but I still haven't gotten around to quilting mine. I also have a couple Christmas UFOs. 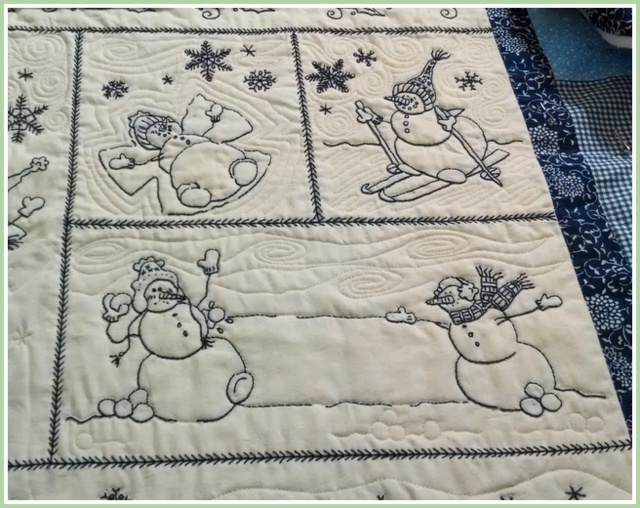 First, is Snowmen A to ZZZZ. 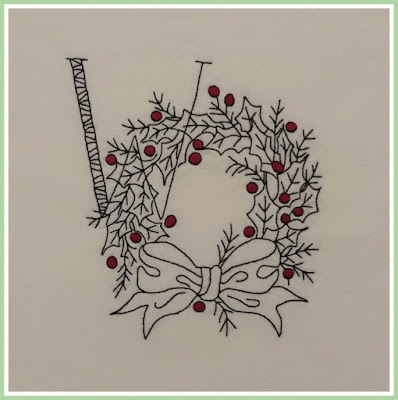 It's another Crabapple Hill Studios pattern. I started this one in 2012. Yikes! I finished embroidering all of the blocks (there are 21), but decided to go back and add red accents to some of them. I'm almost halfway through with that now. 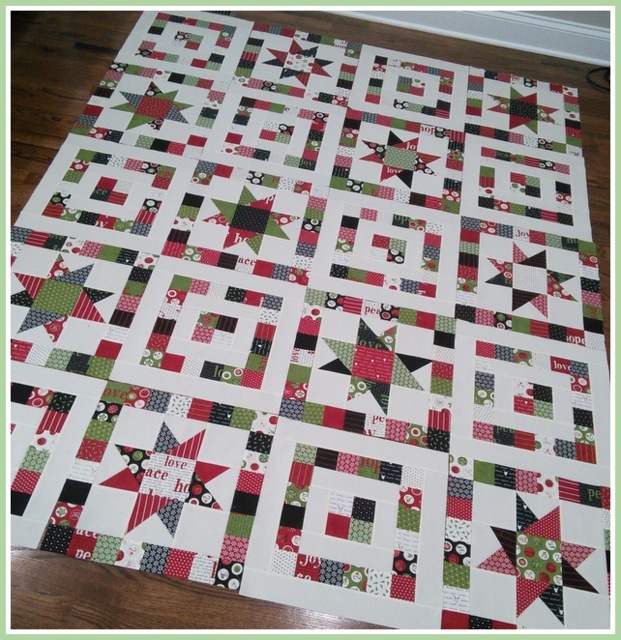 And after seeing all the gorgeous Lucy quilts out there, I decided I wanted my very own Christmas version. I started gathering fabrics last year. I now have everything cut out, I just need to start sewing! 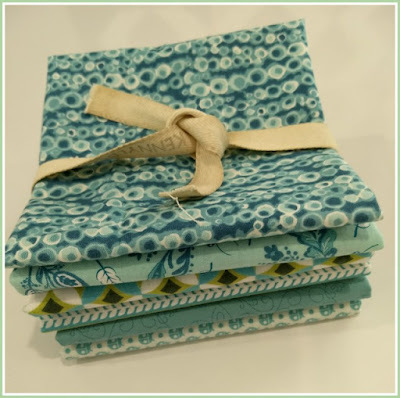 Lucy is a pattern in Miss Rosie's Farmhouse Favorites. I'm a member of great quilt bee and have been for the better part of 10 years. We're a pretty active group and try to do something new every year. This year I'm teaching them how to free motion quilt. 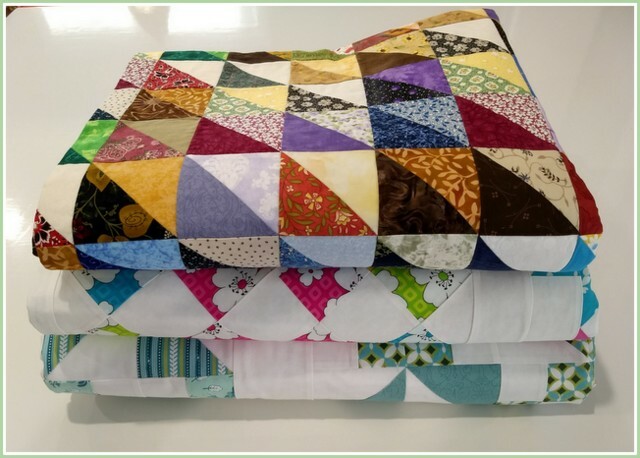 To that end, everyone has made the same quilt sampler and I will show them how to quilt each block differently, so they can try out a bunch of different techniques. I actually made 2 identical samplers. 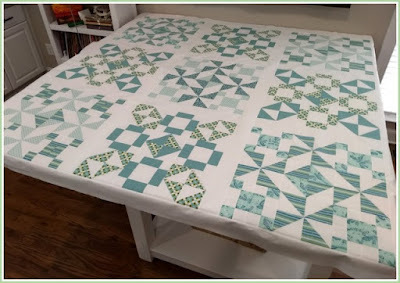 I'm in the middle of quilting the first one (which they'll be able to look at in advance) and I'll quilt the second during class. 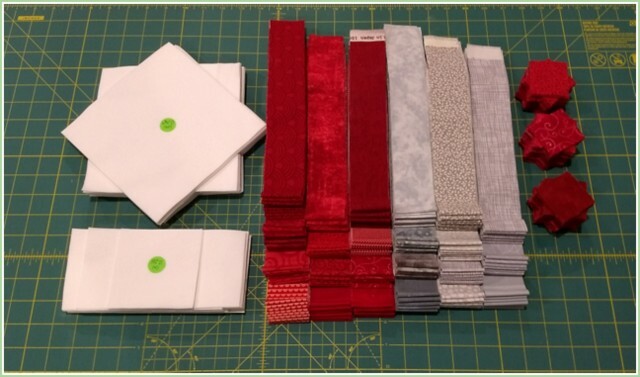 As if that isn't enough, I somehow lost my brain and suddenly thought it would be a good idea to decide to make (112) 3" blocks each with 32 pieces in them. Why? Because it sounds like fun??? More on that later. In any case, it looks like it's going to be a busy year. It will be interesting to look back at the end of the year and see how much of this I actually get done and what other projects end up taking priority. 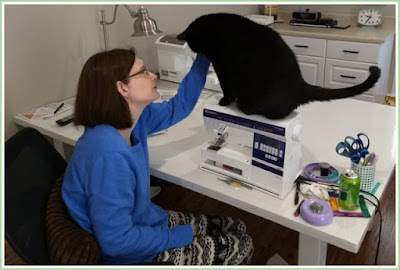 Hopefully my health holds up this year and I can spend many happy hours in front of my sewing machine doing what I love. Here's hoping you can do the same! 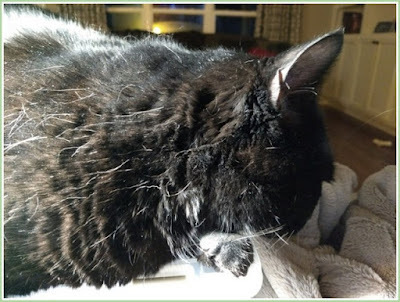 Gabriel had surgery several days ago to have some lumps removed on her chest and one on her head. Fortunately they were benign. 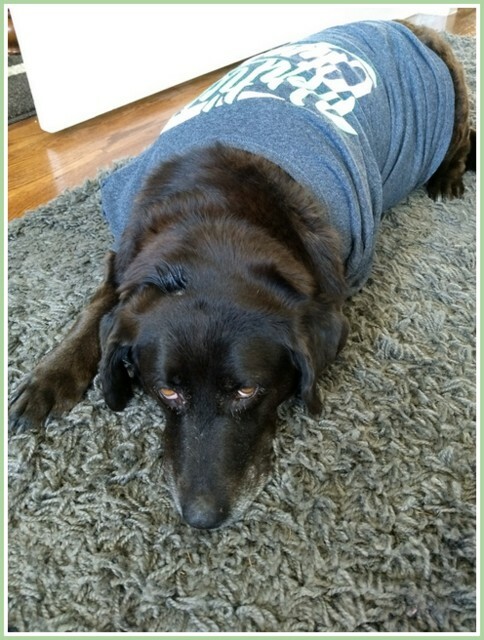 To prevent her from licking the incision, she has to wear a t-shirt. Luckily, she doesn't mind and she's just so adorable in it! 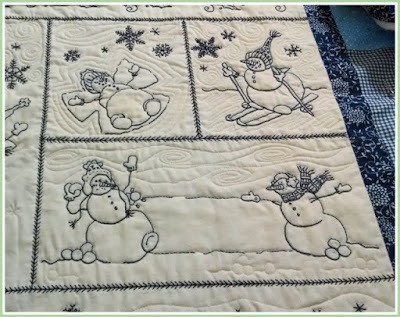 One of the long time quilts on my UFO list is Snowmen A to ZZZZ. This is a Crabapple Hill Studios pattern. 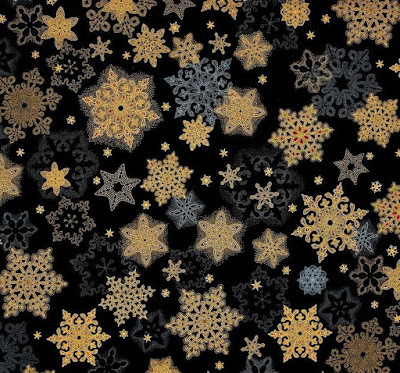 (I love their patterns!) I'm not sure when I started it but I know I took a break for a couple of years sometime around Noel. 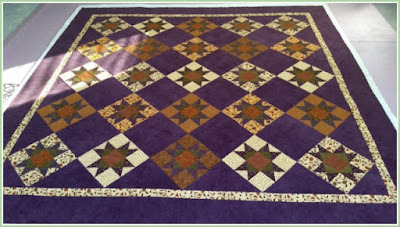 In fact, my mom actually worked on a couple of the blocks for me. 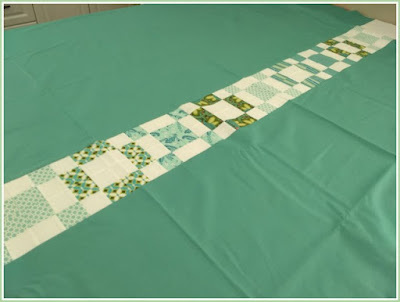 (She's making the same quilt, but finished stitching her blocks a long. long. long time ago.) 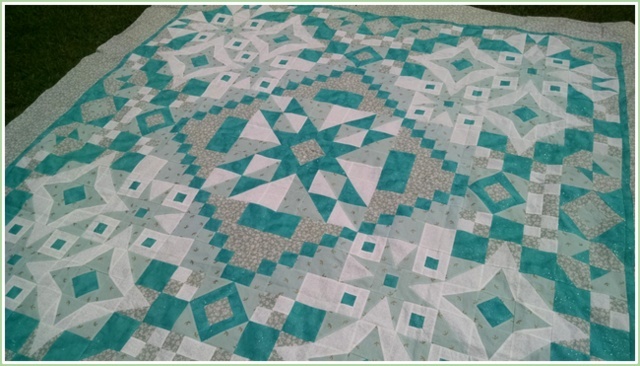 I picked it back up several months ago and was very excited when I finished stitching the last block shortly before Christmas! Yeah! I didn't have either the inner or outer border fabrics yet, but since it was the holidays, it was the perfect time to buy them. After much deliberation, I picked this Black Metallic Snowflake from Holiday Flourish by Peggy Toole for the outer border. If you look closely, you'll notice that a few of the snowflakes have red in them. It's not a lot, just a touch really. 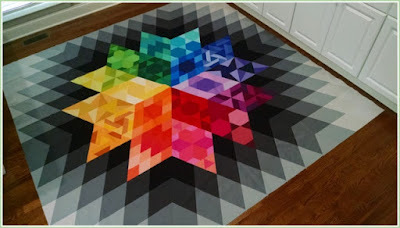 But seeing that had me rethinking my quilt. 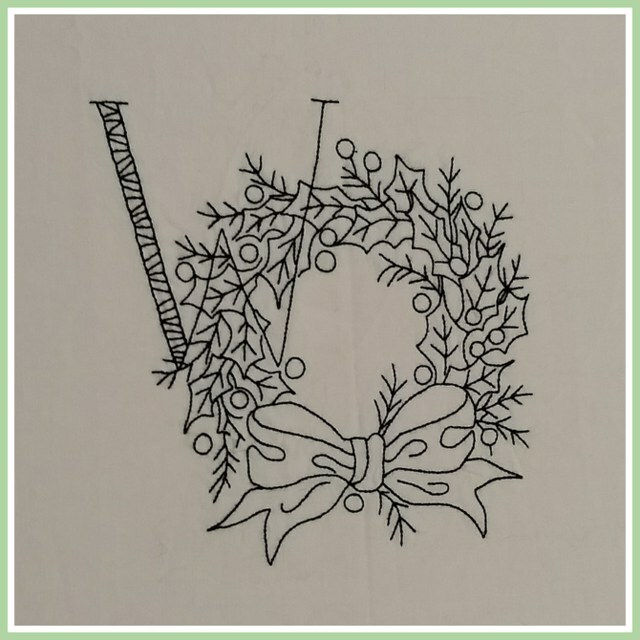 I stitched all of my blocks using black perle cotton on a cream background like in this Wreath block. 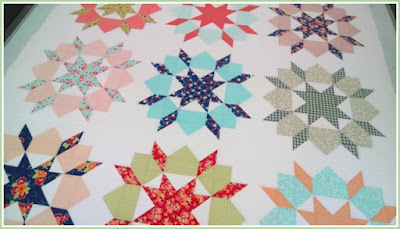 Because of the border fabric, I've now decided to go back and add accents to some of the blocks with red thread. So far I've only done the one block, but I like the pop it gives it. The inner border is also a mottled red so I think it will it all together nicely. Hopefully it won't take too long to make changes to these blocks. 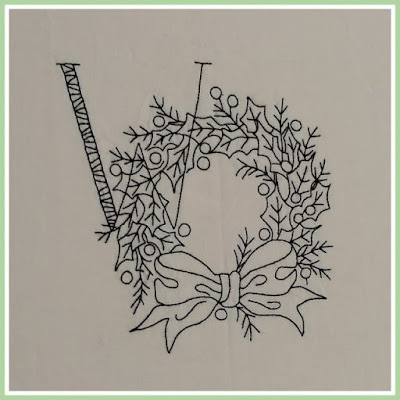 I'd love to have this one done before next Christmas! "Make sure that nobody pays back wrong for wrong, but always try to be kind to each other and to everyone else." It's a fact that I have a impressive daunting number of UFO's to complete. Every year I hope to whittle that number down, but since I do my own quilting, it seems to grow instead of shrink! 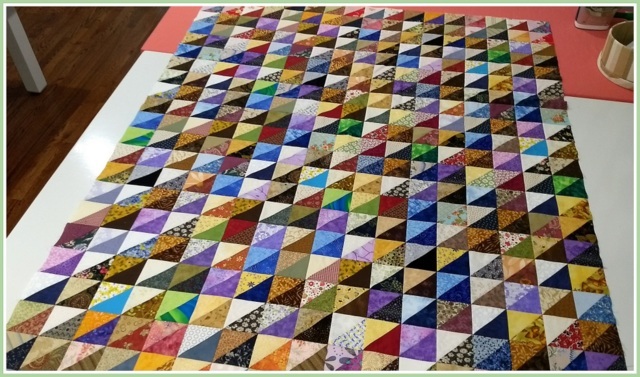 As of today, I have 42 quilt tops needing to be quilted. So I try to talk myself out of starting new projects and only working on the ones I have. Unless of course it's a prayer quilt. I've always felt free to stop working on any other projects if I feel like I need to make one of these. 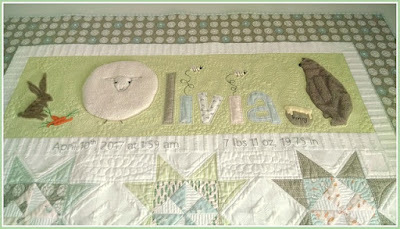 Recently I really felt the call to make one for a friend's daughter. I'm sure everyone reading this has gone through their own health issues or know someone close to them going through them. Unfortunately it's an all too common part of life. But when it happens to someone young, it's just that much harder. 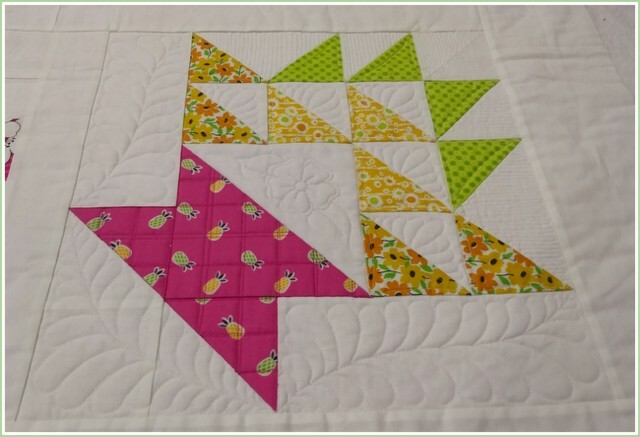 Melissa Corry of Happy Quilting designed a quilt using the new Moda Cake Mix Recipes and I thought it would be a fun pattern for this fabric. She used Cake Mix #5. The layout looks SO much more complicated than it is. It's actually just a mix of 4-patches and HST's. 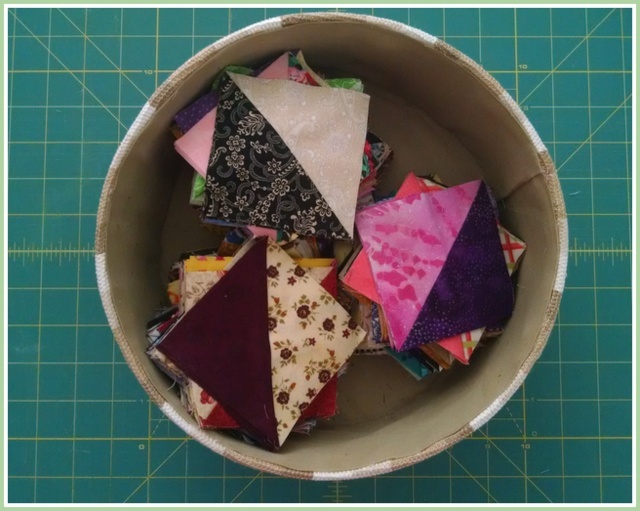 LOTS of 4-patches and HST's. It still went together pretty quickly. And because everything was sewn using the Cake Mix paper, it went together perfectly! I must have left my brain at home when I went to purchase the backing fabric though, because I didn't buy quite enough. 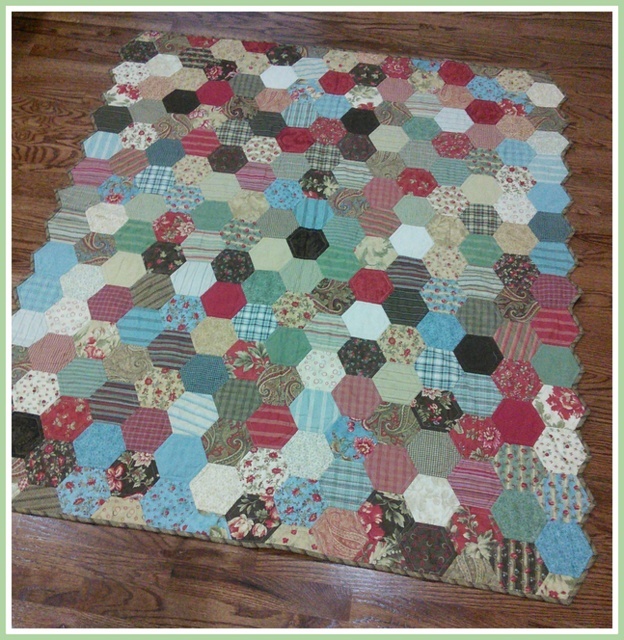 I had some leftover blocks from the quilt so I added them to the back to make it big enough. 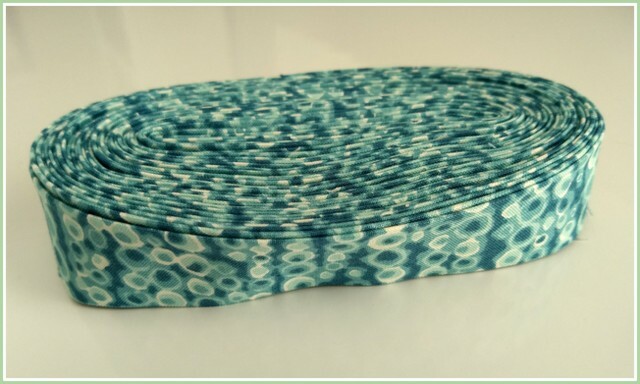 It will serve double purpose as the label once it's quilted. All I need now is some white batting and a warm enough day so I can baste it. 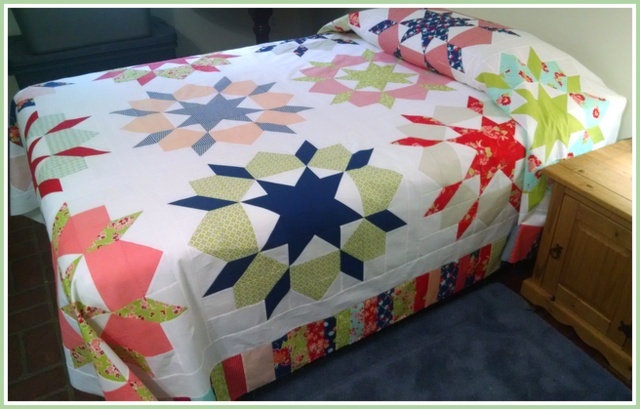 (I spray baste all my quilts.) I plan to quilt it and get it to it's new home as soon as possible. 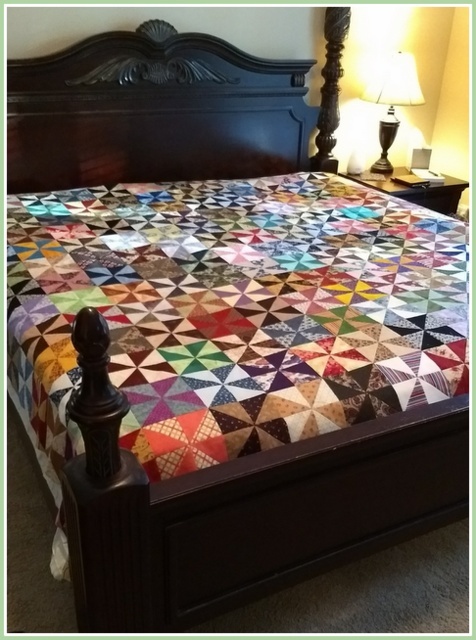 I actually had a lot of help making this quilt. 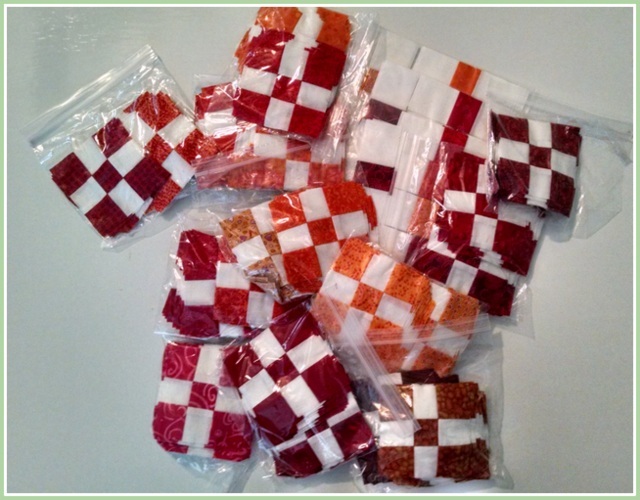 From the same someone who has continuously helped me 'write' this post! 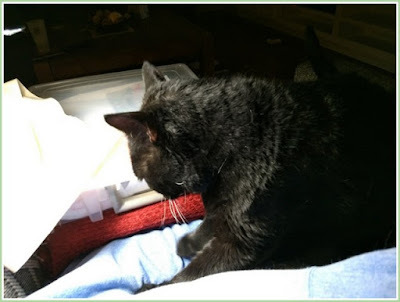 This is my sewing buddy David. He does NOT like to be ignored and keeps walking across my laptop while I'm trying to type. 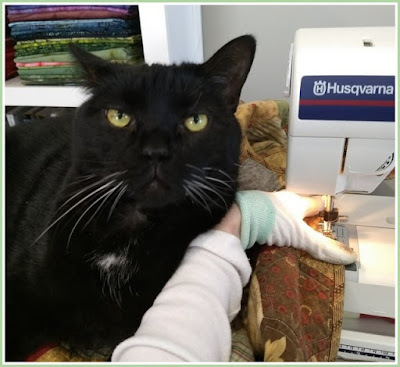 He also likes to lie in front of the needle on my sewing machine and routinely climbs on top of it to keep me company. It's no secret that I didn't spend much time sewing in 2015 or 2016, both because of building a new house and because of health issues. This year I was really able to get back to quilting and worked on quite a few projects; I was just terrible about blogging about them. In the interest of starting over with a clean slate, I thought I'd quickly review those projects I finished in 2015, 2016 and 2017 that I actually did post about. 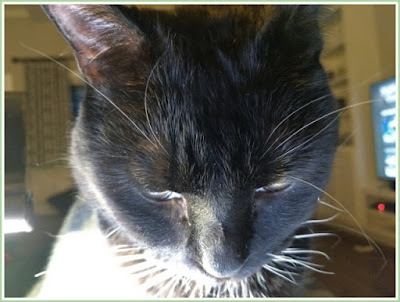 I've included links to those posts. In 2015, I finished 2 quilts and 3 quilt tops. 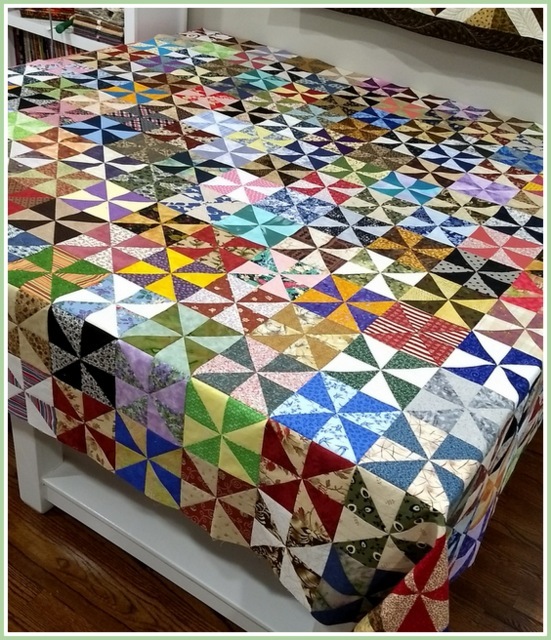 I only finished one quilt and one quilt top in 2016. 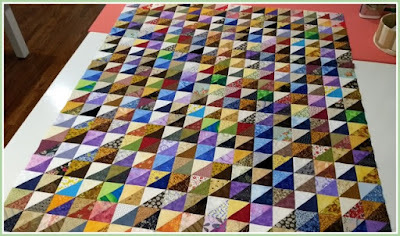 And I only blogged about a couple of quilts this year although I finished at least half a dozen more.